Tonight at 8pm on Connected 2 Jazz on Bush Radio 89.5FM we celebrate another centenary: that of innovative trumpeter and bandleader Dizzy Gillespie, who, with Monk, Charlie Parker and a few others, was responsible for introducing bebop into jazz. John Birks Gillespie was born on 24 October 1917. 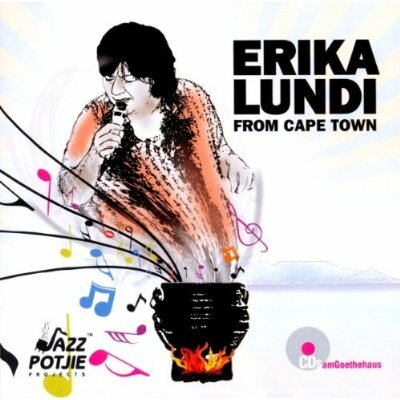 On CONNECTED 2 JAZZ on Tuesday night at 8pm, 30th October, Nigel Vermaas will be devoting his whole show to singer Erika Lundi, whose excellent cd ERIKA LUNDI, FROM CAPE TOWN has been released on the Jazz Potjie label. Erika sings jazz, rock, funk, soul, you name it, and has a great voice and a wonderful ear. “She should be far better known than she is”, says Nigel. Erika will talk about her early days here and outside the country, and the crazy nature of “the jazz life”. Although she is intensely focussed on her music, Erika also loves to laugh – often at her own expense. “And she seems entirely without ego”, adds Nigel. Her friend Michele Maxwell (well-known singer, pianist & actress) shares her insights about Erika, as does keyboard player and Jazz Potjie Producer Andreas Wellmann. This two-hour-long feature will, of course, include lots of music, mainly Erika singing with musicians of the calibre of Mac McKenzie, George Werner, Hilton Schilder, James Kibby, Wesley Rustin, Andreas himself and many more, but there’ll also be a few tracks from U.S. artists who’ve influenced or mentored her, such as Nancy Wilson, Dizzy Gillespie and Kenny Barron. Nigel Vermaas is CONNECTED 2 JAZZ every Tuesday night from 8 to 10 on Bush Radio 89.5fm or online. On CONNECTED 2 JAZZ on Tuesday night 4 October at 8 o’clock, Bush Radio 89.5fm will be celebrating the life and music of the late Basil Moses – bassist supreme – who passed away on 5 June, having suffered many strokes as a result of cancer. You’ll hear Basil in duo, trio and quartet settings as well as a larger ensemble. You also hear the insights and memories of Basil’s brothers, Eddie and Cliffie, as well as those of Dave Ledbetter, Sathima Bea Benjamin, Gavin Minter, Hilton Schilder, Andreas Wellmann, William Rezant, Emily Bruce, Paul Sedres, Theo Lawrence and Cliff Wallis. Excerpts from Basil’s funeral service at St Marks Church in Athlone on 10th June will also be included in the two-hour tribute. CONNECTED 2 JAZZ is presented by Nigel Vermaas. If you’re a MY KINDA JAZZ fan, the bad news is that Nigel Vermaas’s show ends on 30 April after 5 years of bringing you his personal selection from 8 to 10 on a Saturday night. The good news is that he’s back on Tuesday 3 May with CONNECTED 2 JAZZ. The time stays the same, 8 – 10 p.m..
Nigel has been presenting jazz and other music shows on radio for over 30 years and he’s interviewed many prominent jazz musicians, including Abdullah Ibrahim, Cassandra Wilson, Abbey Lincoln, Kesivan Naidoo, Hotep Idris Galeta, Jason Moran, George Duke, Johnny Fourie, Archie Shepp, Courtney Pine, Charles Lloyd and Toots Thielemans. He’s made countless documentaries on jazz, focusing on the Cape Town International Jazz Festival over last 12 years. He’s also compiled in-depth tributes to a number of our late jazz musicians, including Robbie Jansen and Alex van Heerden. Be CONNECTED 2 JAZZ on Tuesday nights on Bush Radio 89.5 from 3 May from 8 p.m. till 10 p.m.